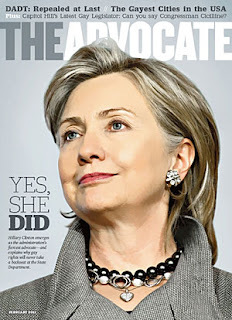 I just read my subscription copy of the February 2011 edition of The Advocate, and I loved the article written about Hillary Clinton. I encourage you to read it here. She appears to be a very enlighten individuals that cares deeply for all people. "Just as I was very proud to say the obvious more than 15 years ago in Beijing- that human rights are women's rights, and women's rights are human rights- well, let me say today that human rights are gay rights, and gay rights are human rights, once and for all." "I just really have a strong negative reaction to prejudice, discrimination, hatred, violence- anything that tries to delegitimize or marginalize any of our fellow human beings. So it fits into my long-term and personally felt commitment to expanding the circle of human rights for everyone."